Attorney John LaCava has more than 25 years of experience in handling personal injury and accident claims, including car and motorcycle accidents, workers compensation, falls, apartment building fires, and wrongful death. The Law Offices of John J. LaCava LLC has over 25 years experience representing clients in personal injury, workers' compensation, negligence and civil litigation cases. Attorney John LaCava has received verdicts or settlements in over one thousand accident cases, and has won several million dollar verdicts. In each of these areas, the experience, knowledge, and dedication he has shown has earned the trust and respect of both clients and peers in the legal community. Attorney John LaCava was a founding partner of the Stamford, CT law firm of Barr & LaCava before opening his current law practice, the Law Offices of John J. LaCava, LLC. Our Mission is to help you Every Step of the Way. We put the client at the center of everything we do. Our goal is to make the legal process as clear and efficient as possible, and to empower our clients with the information they need to make good legal decisions regarding their cases. We know you probably have many questions. What you will find at our firm is a friendly and professional office environment where the entire staff is client oriented and responsive to clients' needs and concerns. We have three Fairfield County law offices help you. We are available with day, evening or weekend appointments. If you are unable to come to us because of a serious personal injury due to an auto accident, work injury or other cause, we will make hospital or house calls as necessary - and we maintain a 24 hour answering service. We also offer strong legal representation and a long, well-established track record of successful results for accident and serious injury victims throughout Southwestern Connecticut. 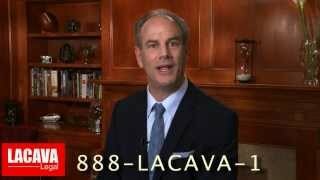 John LaCava has more than 25 years of experience with personal injury and workers' compensation cases. Mr. LaCava is longtime member of the Million Dollar Advocates Forum, which requires a verdict or settlement of at least one million dollars. What this means is that he has shown the ability and skill necessary to handle cases involving serious personal injuries, and to fight and win for his clients against large insurance companies. Attorney LaCava is listed in the Woodward-White publication "Best Lawyers in America" in the field of Immigration. If you have suffered a serious injury or suspect that a member of your family has been the victim of medical malpractice, we are here to help. Our main offices are located in Stamford, Connecticut, but you can reach us at any of our three convenient Fairfield County locations by calling 877-293-6717 or by contacting us online with a brief description of your situation. You can speak with a lawyer directly about your case. Initial consultations are always provided free of charge and appointments can be made for evenings, weekends, and off-site locations. Member of the Connecticut Bar Association, New York State Bar Association and The Florida Bar. 1111 Summer St,. 6 Fl. Select case type... Administrative Law Alcoholic Beverages Animal Law Automobile Accidents Automobile Insurance Civil Litigation Construction Law Criminal Law Dog Bites Head and Spinal Injuries Health Care Hospital Law Insurance Legal Malpractice Liquor Liability Litigation Medical Malpractice Motorcycle Accidents Negligence Nursing Home Litigation Occupational Safety and Health (OSHA) Personal Injury Premises Liability Railroad Accidents Slip and Fall Transportation Trucking Accidents Workers Compensation Wrongful Death Other Case type is required.